A report on internet speeds across the country released on Wednesday shows which cities and states have the slowest and fastest broadband—and which providers are the fastest. Internet testing company Ookla says it measured internet speeds from more than 24 million unique users while making the report of fixed broadband speeds for the second and third quarters of this year. 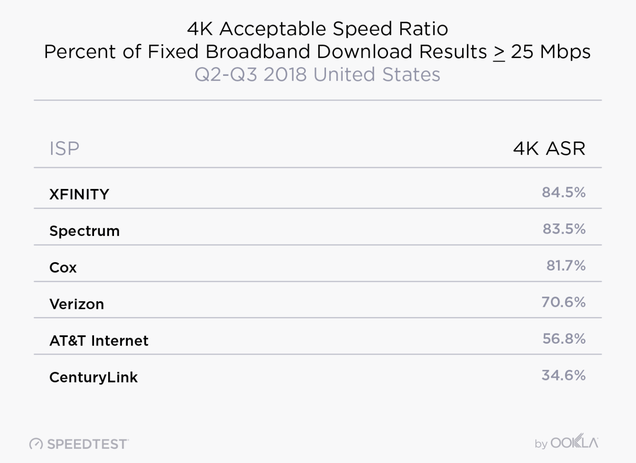 The good news out of the report is that, over the last year, there has apparently been a 22 percent increase in mean upload speed and a 35.8 percent increase in mean download speed over the last year across the United States. The company claims this puts the U.S. 7th in the ranking of download speeds, slower than Hungary but faster than Switzerland, and 27th in the ranking of upload speeds. Within the U.S., New Jersey had the fastest mean download speed (121 Mbps) and Maine had the slowest (50 Mbps), according to the report. Next slowest was Wyoming, followed by Montana, Idaho, and Vermont. Ookla’s test shows that Memphis, Tennessee, has the slowest internet of any U.S. city (average download speed 44.86 Mbps, average upload speed 12.96 Mbps). The fastest city is apparently Kansas City, Missouri (average download speed 159.19 Mbps, average upload speed 127.03), which was the first city to get Google Fiber. Some of the other fastest cities also have Google Fiber, like Austin (average download speed 9143.66 Mbps, average upload speed 70.65 Mbps) and Raleigh, North Carolina (average download speed 137.7 Mbps, average upload speed 75.62 Mbps). But the fastest provider across the country, according to the study, was Xfinity, followed by Spectrum, Cox, Verizon, and AT&amp;T.
Check the report to see if your city was included on the list.